tape will simply slide away. In order to avoid this, the surface energy of the adhesive must be lower than that of the material being bonded. 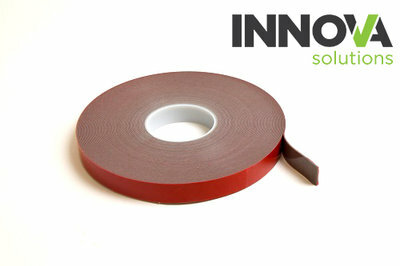 Innova Solutions have therefore formulated a bonding tape with an ultra low surface energy making it suitable for the most demanding of tasks. The benefits of these products are endless, they’ve been specifically designed to withstand extreme temperates, UV, water, chemicals and solvents. They both come with an easy release siliconised filmic liner that improves assembly times. As well as ultra high sheer and high cohesion ensuring they remain strong under stress. Both of these products can replace spot welds and mechanical fasteners. XST 110HT has been created to use for bare metals and non-LSE plastics, whereas LSE 110B has been formulated for painted or post powder coated metals and LSE plastics. Both products are part of the NovaBond range; first launched 10 years ago it has been a huge hit in the industry. The range is environmentally friendly, as well as solvent-free. Both these products are made of heavy duty black acrylic with a red PE film liner and 1.10mm thickness. They are available in 33m rolls with 12mm, 19mm and 25mm widths. Temperature resistance ranges from -40c to +150c for long term fittings.